From the producers of Rambo and The Expendables comes Mine – a powerful and gripping action-thriller following one man’s ultimate fight for survival. 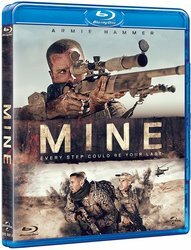 Exploding onto Blu-ray, DVD and Digital Download from 17th April, Mine follows the story of an American field soldier (played by Armie Hammer – Nocturnal Animals, The Man From U.N.C.L.E.) whose actions and reactions in the face of war will leave you on the edge of your seat throughout. Featuring a strong supporting cast of Tom Cullen (Downton Abbey, Weekend) and Annabelle Wallis (The Mummy, X-Men), Mine powerfully explores the human condition, the endurance of one man and his ultimate will to survive against all elements to get back to his family. A must-watch for all action thriller fans, Mine is released on Blu-Ray, DVD and Digital Download from 17th April 2017. The competition closes at 23.59 (GMT) on Sunday 23rd April 2017.